In Real Estate Titans, Erez Cohen shares the advice and learnings of the world's leading real estate experts to create a guide for becoming a savvier real estate player. Cohen draws on his experience as a research and teacher's assistant at Wharton Business School with an investment expert--and his mentor--Dr. Peter Linneman. Throughout his career, Cohen has collected first-hand knowledge from meetings with such real estate titans as Ronald Terwilliger, Sam Zell, Joseph Sitt, and numerous others. Cohen wanted to understand how these real estate giants became so successful, so he refined his quest into three critical questions: What inspires these titans to work so hard and reach such extraordinary levels of success? What are the main elements and traits inside of them that propel them to be so grandiose? How have these individuals, who had less resources, succeeded on a much bigger scale than so many of their competitors? Real Estate Titans contains the 7 key lessons distilled from interviews with several of the world's greatest real estate investors. These critical lessons offer insight into the mindset, tactics, and habits that each of the interviewed titans possess. Once you implement these key ideas--which you won't find anywhere else--into your business, it will grow exponentially within a matter of months. 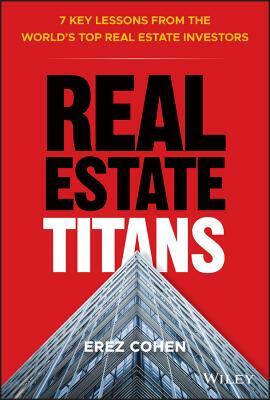 Real Estate Titans offers an insider's view into several of the most successful investors on the planet. The book's compelling stories and lessons show why real estate is such a wonderful and important business, and it also offers a roadmap for becoming a world class real estate player. EREZ COHEN is an experienced real estate investor and developer. He has been directly involved in the acquisition and development of over 12 million square feet of real estate, with a value of more than $3.5 billion. Throughout his career, he has received several recognitions, amongst them the Rising Star Award from the Urban Land Institute, and the Bucksbaum Fellow from the Zell/Lurie Real Estate Center at Wharton Business School.